Last week the snoek (pronounced: snook!) 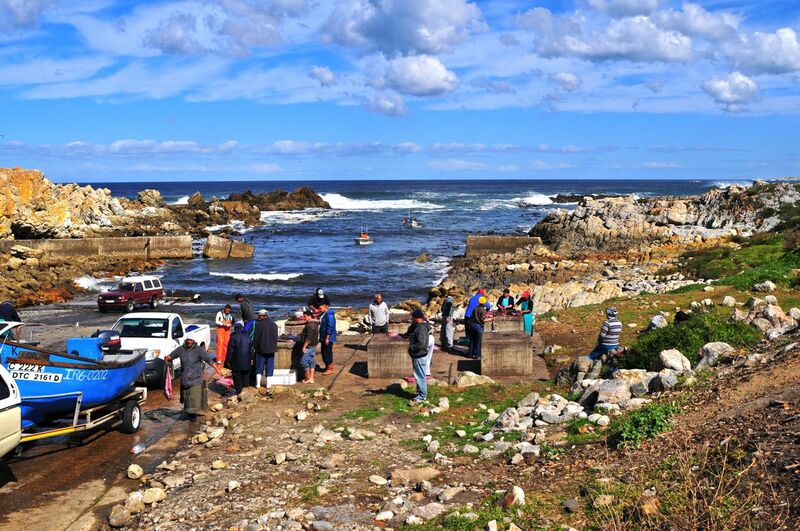 [Thyrsites atun] were running in great shoals in the coastal waters off Kleinmond and plenty of fishing boats went out for a catch. Coastal waters between Betty’s Bay and Kleinmond. 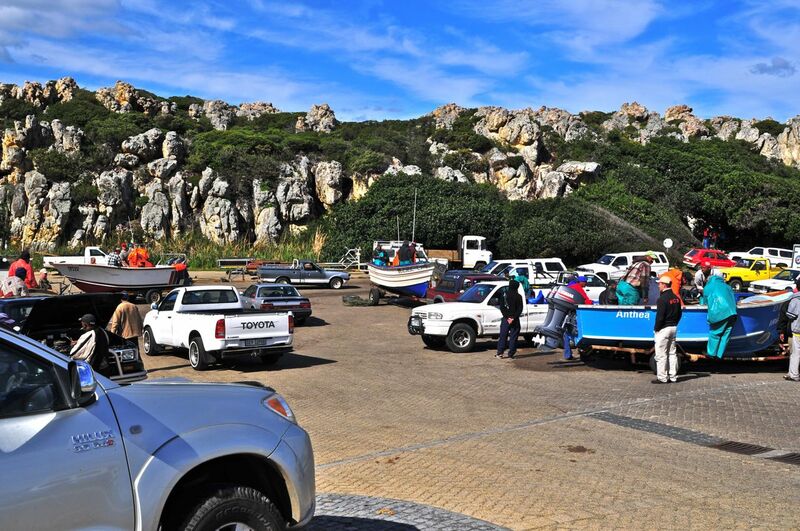 The local fishermen enter the sea with their basic ski-boats without fear and often enough without adequate safety equipment. Strong currents created by two oceans merging at the Cape, create freak waves which can easily capsize one of these boats and the water is too cold to survive for any length of time, testified by all the crosses along the coast. 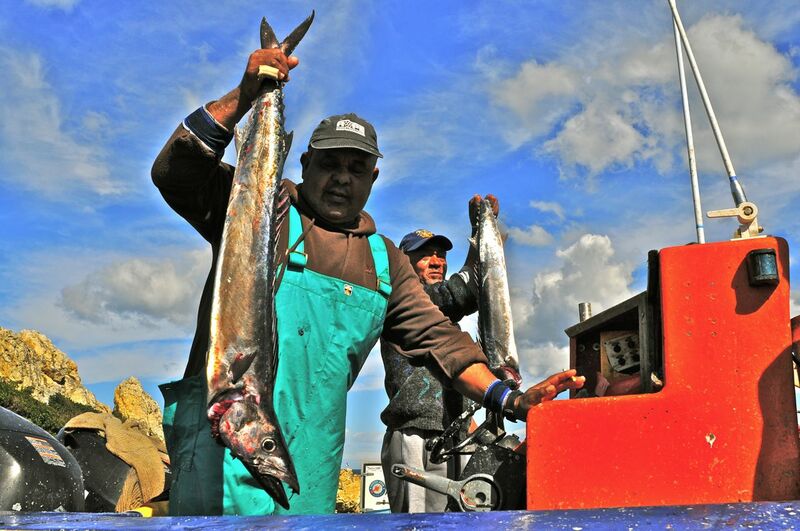 But these men are brave albeit out of sheer necessity to feed their families, real men, proud men, no holding back in catching the fish where it swarms and plenty of it. Already gutted on board and quite a specimen – in appearance much like a Barracuda, but not of the same family. 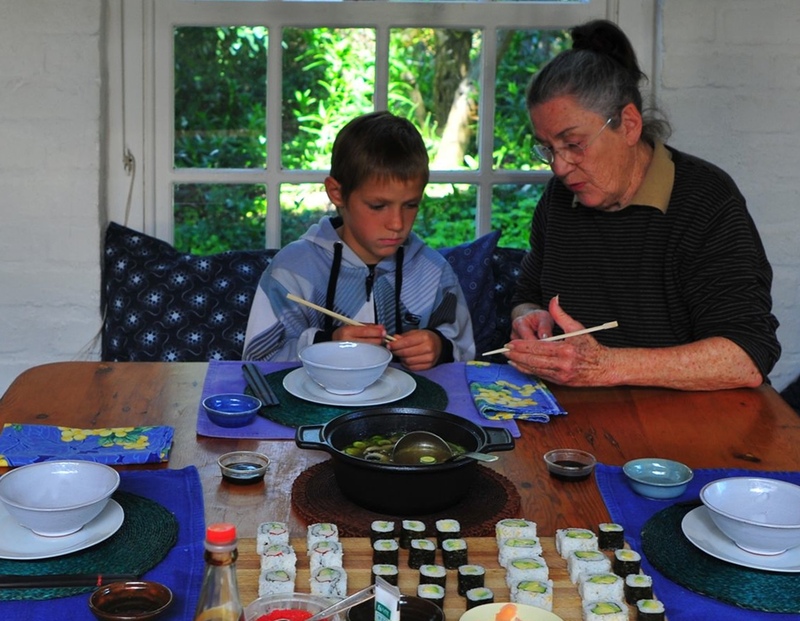 Our grandson Luke visiting from France and spending his school holidays with his cousins and family in Hout Bay, stayed with us for a time and one day while shopping with Oma, decided on a small Sushi offering. Oma showing Luke some fundamentals. 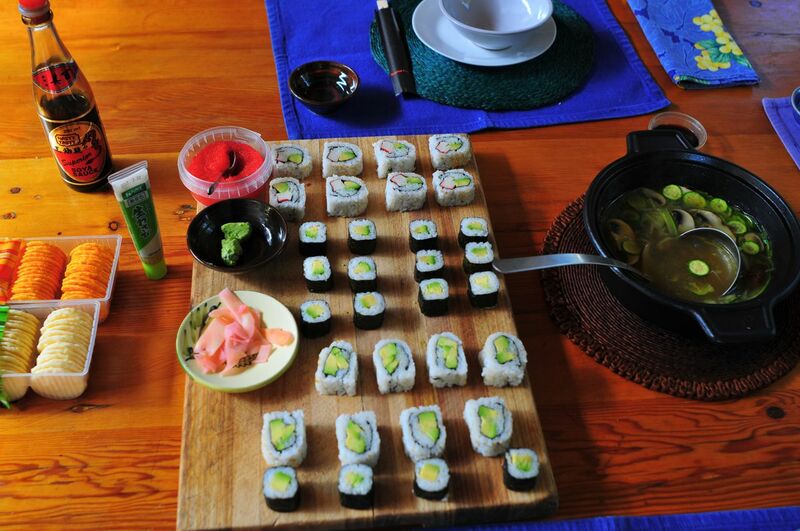 A non-fishy sushi – we shared it and loved it. Thanks, Luke! 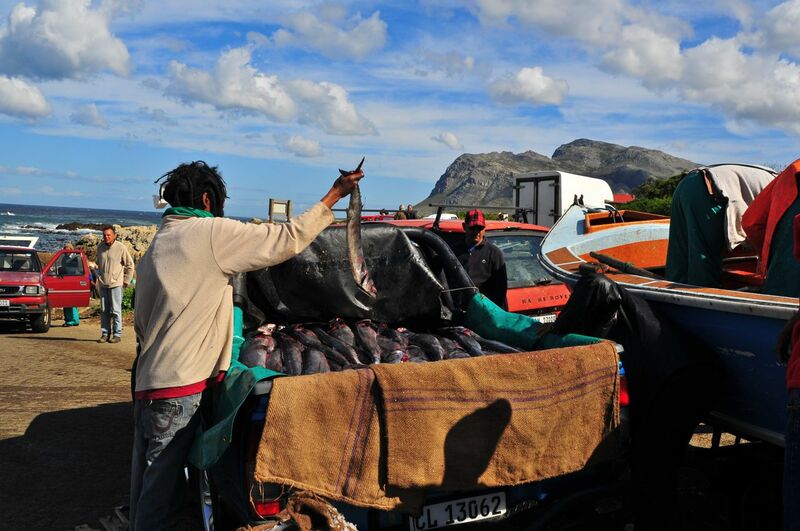 – As for the snoek, there are basically three ways to skin this cat: straight-forward: salted and smoked. Traditionally: butterflied, spiced, covered with smooth apricot jam and quickly barbecued over hot coals (it must be nicely brown and crips on the edges while staying juicy) and served with sweet potatoes. And then, also a traditional dish, made with leftovers from the barbecued snoek, if any or smoked snoek – “smoorsnoek”: layers of fried potatoes, lots of fried onions (sometimes with shredded cabbage added) and snoek flakes baked in the oven – an economical dish and rather delicious! Snoek=Tiefseehecht in German; at least if you follow the ingenious South African translator Arnold Blumer (R.I.P.). It is also processed in Germany, re-imported and locally marketed as “Kap-Seehecht”.